Oops - we don't appear to have a video for the Digital Sender 9250C. 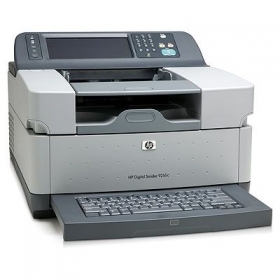 Save space and simplify document management with the HP 9250c Digital Sender. Improve efficiency and reduce costs by creating digital copies of your paper documents, which you can share, store and retrieve, easily and quickly. Increase productivity – scan and send documents quickly and efficiently with this dedicated device. Improve efficiency and increase productivity with this dedicated device. Convert large volumes of paper documents into digital files for fast sharing and retrieval. Scan to e-mail, network folder, fax and printer2 at up to 51 images per minute. Easy to use, install and manage with an enhanced, intuitive control panel and a separate keyboard. This device is easy to use, install and manage. Navigate functions comfortably using the intuitive touch screen control panel with custom menu keys or separate keyboard. Refine search options with Optical Character Recognition (OCR) software 2. Transmit data securely from the digital sender to the supported destination. Use the secure send key to transmit data via a secure channel to a server 1 that supports HP DSS 4.03 software. Authentication verifies the sender's identity, encryption protects files from access, and you can erase the device's hard drive.